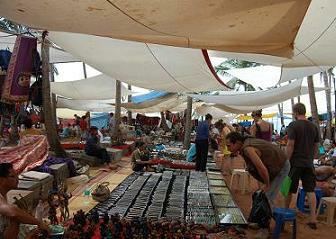 The Anjuna flea market held every Wednesday behind the south end of Anjuna beach is legendary in Goa. What started as a low key event attended by independent travellers buying party clothes / smoking chillums and funding their wanderlust has mushroomed in the past few decades, becoming a beast of unrecognizable proportions. This is a market on an epic scale. Women from Karnataka bedecked in tribal costume sell colourful belts and purses, the smell of spices from the spice merchant stall mingles with Ayurvedic incense and jasmine blossoms. Rajasthani bedspreads flutter and glitter in a light breeze that is barely felt in the relentless sun. Lapis lazuli and turqoise glow in the quiet, covered Tibetan market. Maharashtrans selling beads weave through the crowds, the talking drums talk and the snake charmer's cobra flares its hood. The market is hot, overwhelming, frustrating but essential viewing. Several cafes inside the market sell cold drinks, snacks and have live music - a welcome break from the craziness of the stalls. Bars by the sea front such as Curlies or The Shore Bar catch the refreshing sea breeze and are great places to cool down and watch the crowds. Prices at the market are high, and most that you buy here can be bought more cheaply elsewhere in Goa. Bear in mind, however, pitches are expensive, and many sellers travel a long way to get here. Convert the price into your own currency, and see if you think the cost is fair. Saying that, if you do not haggle at all and pay the first price quoted, you should accept that in the vast majority of cases, you are being ripped off. Bartering over the price is a normal custom in India, and will not be frowned upon. 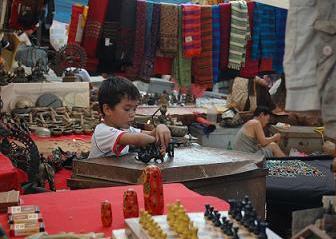 Tibetan stalls often sell at a 'fixed price' and in this case bartering may not be entertained. If you are not sure, walk slowly away from the stall / seller, and see if a lower price is shouted out. Do not suggest a price that you are not prepared to pay, and do not feel pressured into buying anything that you do not want. If you feel you are being hassled, look the person in the eye and give a clear, confident 'no'. The roads around Anjuna are very crowded on market day, and travelling in a big tourist taxi might mean a delay in the traffic. Motorcycle taxis / early starts are advisable. If you are staying in Calangute / Baga, your hotel may offer day excursions to the market (though in many cases it is cheaper making your own way). If you have hired a scooter or bike, you can park right outside the market in the fields near the east entrance and pay a small parking fee for the day. The Anjuna flea market is aimed at foreign and domestic tourists - if you want to see an authentic local Indian market, head to the lively Friday market in Mapusa. 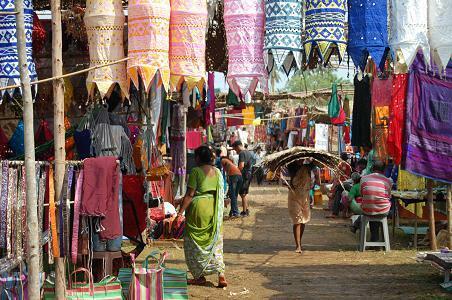 For a similar experience as the Wednesday market but at night, check out Mackies Saturday Night Bazaar in Arpora.